I just learned that I can’t visit any Barnes and Noble store with the release of my upcoming novel Tamarack County, the thirteenth in the Cork O’Connor series. There’s a spat going on between my publisher, Simon and Schuster, and the bookstore chain. No Simon and Schuster author may visit any Barnes and Noble until further notice. It has something to do with money, but nobody seems to know exactly what. I’ve been setting up my tour for Tamarack County, which comes out on August 20. I’d arranged two events at Barnes and Noble stores in the Twin Cities, two stores that have been strong supporters of my work from the beginning and that sell enormous quantities of my work. Then I got the word from New York: No visits to B&N. I called back the Community Relations Managers of both stores, the wonderful women I’d work with to set up the events. We all scratched our heads and said it was crazy, but there it was. The gods had spoken. There’s more. Many S&S authors’ works are no longer being ordered or displayed. I suspect this rift, which has been dragging on for months, has drastically affected my sales and the sales of other Simon and Schuster authors. And I can’t help but think that the entity benefitting most from this kind of nonsense is Amazon. Readers who can’t find authors at B&N and who have no local independent are going to pop onto the Internet and buy there, it seems to me. Or they’re simply not going to buy at all. Don’t get me wrong. I love my publisher. But this business is difficult enough as it is, and I bust my rear end to sell books. Then this kind of chicanery gets thrown into the mix. I have a friend who used to wear a T-shirt at writers’ conferences: Publishing Business—Isn’t that an oxymoron? I grew up in the 50s and 60s, and my favorite movies all had monsters in them. 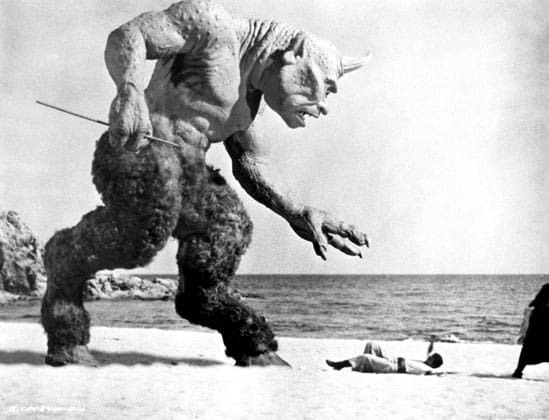 The best of those wonderfully terrifying creatures were the brainchildren of a man named Ray Harryhausen. He was the genius behind the Cyclops in The Seventh Voyage of Sinbad. He created an army of sword-wielding skeletons in Jason and the Argonauts. The Ymir, his alien creature from Venus in Twenty Million Miles to Earth, made me believe in life on other planets—terrible life. His dinosaurs that menaced James Franciscus in Valley of the Gwangi also menaced me in my nightmares. Harryhausen was the best stop-action animator the film world ever knew. With the advent of CGI and the demise of other, earlier, cruder forms of animation, he’s probably the best of his kind that we’re likely ever to know. He died yesterday. I’d just like say goodbye to a guy who made my Saturday afternoons at the movie theater something to look forward to. So long, Ray. Give the angels a thrill.